A great selection of films is now on sale for December and January at the Northampton Filmhouse, and with the increased flexibility of having a second screen, extra film screenings will be added to this schedule to meet demand. Brilliant new independent films include the satirical comedy Sorry To Bother You, heart-warming drama starring Robert Redford, The Old Man & The Gun, and the romantic drama Disobedience. The cinema continues to present the best big new releases, including Disney sequel Mary Poppins Returns, as well as Laurel and Hardy biopic Stan & Ollie and darkly funny period drama The Favourite. Northampton Filmhouse also presents a selection of films from Comedy Genius, a nationwide season that celebrates the greatest onscreen comedy talent, from ‘40s classic His Girl Friday to modern comedy classic Mean Girls. Meanwhile, a great selection of Christmas classics feature to celebrate the upcoming festive season, including Filmhouse favourite It’s A Wonderful Life. The programme of event cinema features screenings of top class drama, ballet and opera, including the visceral production of Richard The Second starring Simon Russell Beale. Over the coming months the cinema welcomes a selection of top movies including Sorry To Bother You, which stars Lakeith Stanfield as a telemarketer who discovers a magical key to success, propelling him to a universe of greed. The film premiered at the BFI London Film Festival in October and also stars Tessa Thompson (Creed), Steven Yeun (The Walking Dead) and Armie Hammer (Call Me By Your Name). The Old Man & The Gun stars Robert Redford in his final acting role after he announced his retirement from the profession. Redford plays aging bank robber Forrest Tucker, who, at the age of 70, carries out an unprecedented string of heists. The film also stars Sissy Spacek, Casey Affleck and Danny Glover. Romantic drama Disobedience stars Rachel Weisz as a women who returns to the Orthodox Jewish community that shunned her for her attraction to a female childhood friend (Rachel McAdams). The film comes from Oscar-winning director Sebastian Lelio (A Fantastic Woman) and the screening on Thursday 13 November will be December’s Q-Film screening. Mysterious horror remake Suspiria takes place at the centre of a world-renowned dance company, where a darkness swirls that will engulf the artistic director, an ambitious young dancer and a grieving psychotherapist. From Oscar-nominated director Luca Guadagnino (Call Me By Your Name), the film stars Dakota Johnson, Chloë Grace Moretz and Oscar-winning actress Tilda Swinton. Daniel Day-Lewis stars in British comedy-drama My Beautiful Laundrette as an ex-National Front member who is employed by a childhood friend to work in his Uncle’s launderette. Before long, the friendship between the two develops into something more. Directed by Stephen Frears (The Queen), the film will be January’s screening held in association with Q-Film Northants. 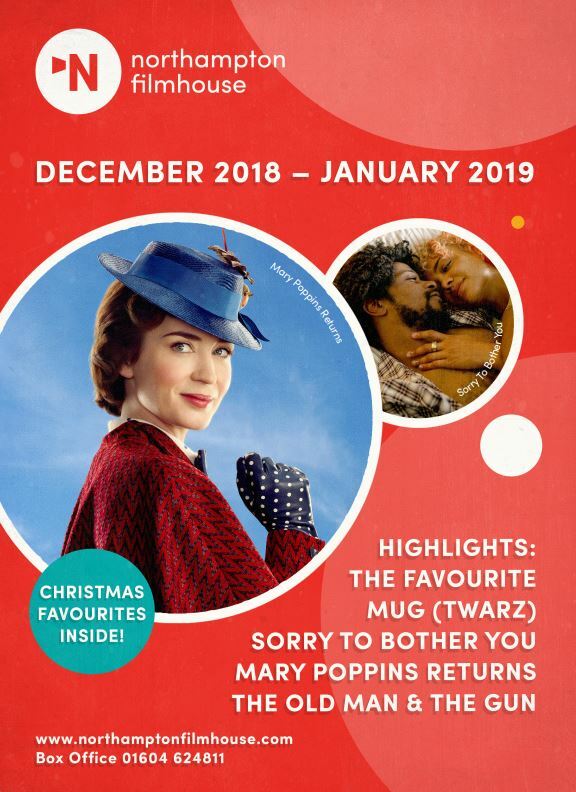 The latest big releases coming up at the Northampton Filmhouse include the Disney sequel Mary Poppins Returns, starring Emily Blunt in the title role. Mary Poppins returns to help the next generation of the Banks family find the joy and wonder missing in their lives after a personal loss. Meryl Streep, Colin Firth, Angela Lansbury, Lin-Manuel Miranda and more make up an all-star cast. The on-sale date for screenings of Mary Poppins Returns in this season will be confirmed in the near future. Steve Coogan and John C. Reilly star as Laurel and Hardy in Stan & Ollie. The film follows Hollywood’s greatest comedy double act as the pair embark on a variety hall tour of Britain and Ireland seeking to secure their place in the hearts of the public. Wickedly funny comedy-drama The Favourite stars Olivia Colman as Queen Anne in this period drama from acclaimed director Yorgos Lanthimos (The Lobster). The film also stars Rachel Weisz as the Duchess of Marlborough, whose relationship with Queen Anne is turned upside down upon the arrival of the Duchess’s younger cousin Abigail (Emma Stone). Harry Potter spin-off sequel Fantastic Beasts: The Crimes Of Grindelwald was written by J.K. Rowling. It sees Newt Scamander (Eddie Redmayne) team up with Albus Dumbledore (Jude Law) in an attempt to capture the powerful dark wizard Gellert Grindelwald (Johnny Depp) after he escapes from MACUSA (Magical Congress Of The United States Of America). Boxing drama Creed II is the latest instalment in the much loved Rocky franchise. Against the wishes of Rocky Balboa, Apollo’s son and current champ Adonis Creed (Michael B. Jordan) accepts a challenge from Drago’s son. The film was co-written by Sylvester Stallone. Crime drama White Boy Rick comes from Yann Demange, the award-winning director of ’71. Matthew McConaughey stars as Richard Wershe Sr. in this moving true story of a blue-collar father and his teenage son, who became an undercover police informant and later a drug kingpin all before he turned 16. Great new films from around the world include Mug (Twarz), an award-winning Polish drama from director Malgorzata Szumowska. Fun-loving Jacek is disfigured in an accident, becoming the first person in Poland to receive a face transplant, leading to his status as national hero and martyr. Critically-acclaimed Danish drama The Guilty tells the story of former police officer Asger Holm, who answers an emergency call from a kidnapped woman. When the call is suddenly disconnected, the search for the woman and her kidnapper begins. Nuri Bilge Ceylan (Winter Sleep) directs The Wild Pear Tree, a Turkish drama telling the story of aspiring writer Sinan. After he returns home to his native village, he seeks funds to publish a book – but will anyone recognise his talent? Palme d’Or winning-director Laurent Cantet (The Class) directs The Workshop, where teenager Antoine attends a summer writing workshop led by well-respected novelist Olivia. In 3 Days In Quiberon, famous actress Romy Schneider gives her last interview to two journalists in three days driven by romantic desire, professional ambition and the urge for living. Juliette Binoche stars in ballet drama Polina from directors Valerie Muller and Angelin Preljocaj. Rigorously trained from an early age, Polina is a promising classical ballet dancer. About to join the prestigious Bolshoi Ballet, she discovers contemporary dance, a revelation that throws everything into question. A great selection of documentaries includes Free Solo, a stunning, intimate and unflinching portrait of free soloist climber Alex Honnold as he prepares to achieve his lifelong dream: climbing the face of the world’s most famous rock, the 3000ft El Capitan in Yosemite National Park, without a rope. The National Geographic documentary comes from award-winning filmmaker Elizabeth Chai Vasarhelyi and world-renowned photographer and mountaineer Jimmy Chin. In The Price Of Everything, take a deep dive into the contemporary art world where everything can be bought and sold. From director Nathaniel Kahn, the documentary feature gives unprecedented access to pivotal artists and the market surrounding them. Three Identical Strangers is an extraordinary documentary following three strangers who were reunited by astonishing coincidence after being born identical triplets, separated at birth and adopted by three different families. Their story became a global sensation, however the fairy-tale reunion set in motion a series of events that unearthed an unimaginable secret. The programme of classic films includes regular Dementia-Friendly screenings. Over the coming weeks there will be an early evening screening of 1980s classic Labyrinth, starring David Bowie, on Tuesday 18 December. All are welcome but an extra warm welcome will be extended to those living with early onset dementia and their families. The cinema continues to schedule Dementia-Friendly matinee screenings of classic musicals, with the 1957 movie Funny Face, starring Audrey Hepburn and Fred Astaire, on Tuesday 8 January. The classics programme is supplemented with a range of screenings to celebrate Comedy Genius, a nationwide season that celebrates the greatest onscreen comedy talent, led by the BFI, Independent Cinema Office and BFI Film Audience Network. Mabel Normand was the irrepressible spirit of early Hollywood, and can be seen in a package of short films in The Marvellous Mabel Normand: The Leading Lady Of Film Comedy accompanied by a newly commissioned score from The Meg Morley Trio. Modern classic Mean Girls stars Lindsay Lohan as Cady Heron, a hit with The Plastics, the A-list girl clique at her new school, who makes the mistake of falling for the ex-boyfriend of alpha Plastic Regina. Arguably the Marx Brothers’ funniest film, comedy masterpiece Duck Soup tells the story of a wealthy widow who offers financial aid to the bankrupt country of Freedonia on the condition that the bumbling Rufus T. Firefly be made leader. Cary Grant is hard-charging newspaper editor Walter Burns in Howard Hawks’ classic comedy His Girl Friday. When Burns discovers his ex-wife Hildy (Rosalind Russell) has gotten engaged, he tries to lure her away from tame domestic life. Billy Wilder’s hysterical classic Some Like It Hot stars Jack Lemmon and Tony Curtis as a pair of friends who hide from the mob by masquerading as woman in an all-female band featuring singer Sugar (Marilyn Monroe). Mel Brooks directs Oscar-nominated satire Blazing Saddles in which a railroad worker becomes the first black sheriff of Rock Ridge. He and his perpetually drunk gunfighter friend (Gene Wilder) are the only defence against a wave of thugs attempting to rid the town of its population. Jane Fonda, Lily Tomlin and Dolly Parton star as three female office workers who attempt to get revenge against their sexist and egotistical boss in 9 To 5. In Coming To America, Eddie Murphy plays Prince Akeem, who escapes an arranged marriage and flees to America to find his queen in John Landis’ (The Blues Brothers) comedy. Other classics include a selection of festive favourites as the Christmas season approaches. Audience favourite It’s A Wonderful Life returns, telling the story of a businessman (James Stewart) who is shown what life would have been like if he had never existed. Macaulay Culkin stars as Kevin in ‘90s classic Home Alone. When accidentally left behind when his family takes off for a Christmas vacation, he is left to fend for himself and eventually has to protect his house against two bumbling burglars. Die Hard is the definitive holiday action classic starring Bruce Willis as policeman John McClane who has to protect a skyscraper where a Christmas Eve office party is taking place from a group of terrorists. Michael Caine is Ebenezer Scrooge in The Muppets Christmas Carol, the much-loved ‘90s take on the classic Dickens holiday tale starring The Muppets. Richard Attenborough stars as Kris Kringle in Miracle On 34th Street, a man who claims to be Santa himself. He is hired to be Santa at Macy’s by the mother of a girl who has become sceptical of the Christmas myth surrounding Santa Claus. Jon Favreau (The Jungle Book) directs the much-quoted ‘00s classic Elf, starring Will Ferrell as Buddy the Elf. Accidentally transported to the North Pole as a toddler, he travels to New York in search of his real father.